Courtesy of The Lawn, I was privileged to get my hands on their delectable salads and grills. Truly they live up to their name - it was a casual dining concept on carpet grass in a tranquil, relaxed setting! Oh and if you're thinking that salads are all about predictable, ill-tasting greens, you're in for a surprise as The Lawn has SO many options at really reasonable prices! The Lawn is great for alfresco dining as you can soak in the sights of quaint little streets around the Biopolis complex and well, the sound of tranquility. The only 'noise' was coming from distant chatter! 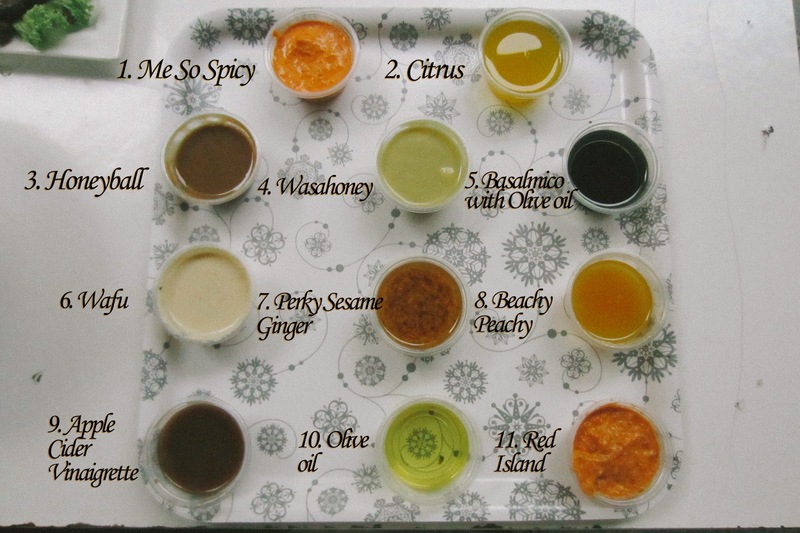 Perfect your meal with The Lawn's home-made dressings! Complete your meal with soup shot, soup bowl or assorted bun. I really loved the transparency of the open-concept kitchen, which allows diners a panoramic view of the food-preparation process. All the vegetables tasted so fresh - as though they were just harvested from a secret farm somewhere within the café itself. A side salad and an accompanying dressing are included alongside the rice. The rice was delightfully fragrant and fluffy, and didn't stick or clump together. I really loved the colours and variety of my spread— Green and yellow peppers, fresh broccoli, corn, Roma tomatoes and alfalfa sprouts. These are the dressings that the service crew generously offered us to sample. Their home-made dressings were SO excellent, I really wish they sold them in jars so that I could stock up on them at home! Among my favourites were the Me So Spicy, Perky Sesame Ginger and Red Island. All of these are ingenious mash-ups of various spices and sauces, e.g: the Me So Spicy is made from fresh chilli, sambal belachan and mint. Indeed, The Lawn is the only Specialty Grill & Salad Café in Singapore where you can customise your very own salad without a hefty bill to go along with it. It's a really great venue for both omnivores and vegetarians to dine and hang-out. As The Lawn enticingly beckons, "Come Meat your Greens", just the way you want it! Soft, juicy and tender, with a subtle herby aroma lingering on your tongue. Had a slight fishy taste, but was a favourite of my partner's. It was a rather huge portion and hit it off really well with the citrus dressing. The sweetness of the chicken was brought out through the marinate, and there were not much fats to be seen. The chunky white meat was a little tough, but the piquant Cajun spices brought goosebumps (in a delectable way) to my taste buds! TOTALLY in love with the prawns. My partner and I were furiously gobbling away. They were evenly cooked and there was no foul, pungent smell that is sometimes encountered with prawns. I loved dipping the prawns in the Beachy Peachy (Premium, +SGD1.00) dressing and the Red Island dressing. Beef done in a different way - in balsamic vinegar. I honestly think both beef choices have their own merits. While the Aceto Balsamico Beef Cuts seemed tougher than Ben's Beef Rub, it was also juicier. Visually, what sets them apart is the darker colour of the Aceto Balsamico Beef Cuts. Yep! It took a few hours to finish ALL of this mind-boggling but delectable spread, but we thoroughly enjoyed our experience with lots of sweet, hearty laughter in between. There also are some 'Chef's Picks!' salad combinations that you can opt for if you're not into personalizing and customizing your meal (or are simply too lazy :p). I promise you that it's great all the same. If you're around the area, I would highly recommend that you head down to The Lawn at Biopolis (or Shenton Way) and give it a try! After this wholesome experience, I'll definitely be going there again after New Creation Church services end on Sunday! :) I'm sure you will be awed by their lovely, chirpy service and wide variety of options set amidst the lush greenery. They are doing DELIVERY right now (hooray to a healthier office lifestyle in Singapore!) and you can check that out by clicking here! Thanks for this review. We live nearby and after reading the review today in the morning we've been in The Lawn in 10 minutes for lunch. We got the Chef's Pick with the prawns, which was really good and the balsamic vinegar beef. The portions were right and the staff was friendly. And it wasn't expensive at all. What I really liked was the chili dressing. We took one portion back home to try with other food. Wow wonderful place i really like this place want to visit this and spend my holiday in this place last time this kind of view i was saw in spain where me and my family spend the holiday vacations.